As a Baltimorean, born and bred, I have a soft spot for the bird that represents the state of Maryland and our home town baseball team. The Baltimore Oriole is an iconic image in Charm City for all kinds of reasons. For me it is about the living bird; it does not have to do with the threat of the Bullock’s Oriole taking over the gene pool of the family. It has to do with the fact that this species, and all orioles, are in a class of birds known as weavers: there in lies the story. 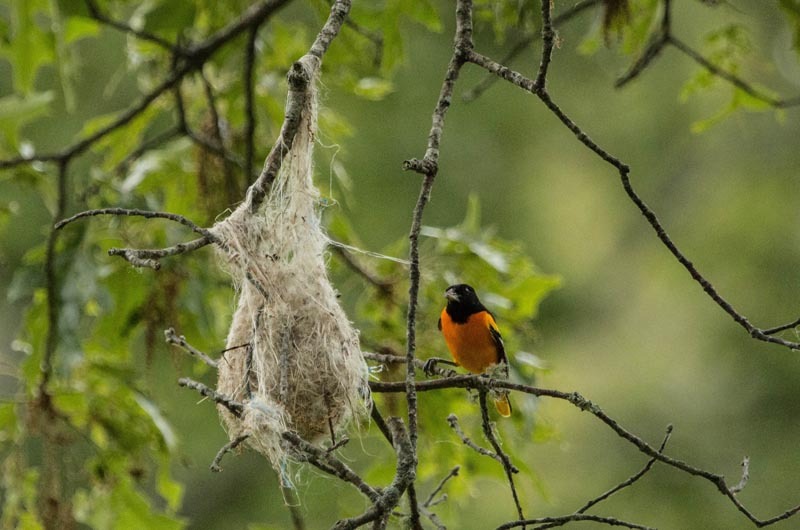 Their carefully constructed nests are woven together with grass, reeds, moss, thread, bark, and anything the Orioles can find in the vicinity. The nests are usually 3 to 4 inches deep and 2 to 3 inches across. They build a larger bottom chamber that is 3 to 4 inches wide, where she will lay her eggs. The nest will get hardened with bird dung. It hangs delicately from newly leafing branches of trees that thrive in their breeding regions. Some people say the nests look like socks drying on a clothes line, as they sway to the winds that have them in near constant motion. 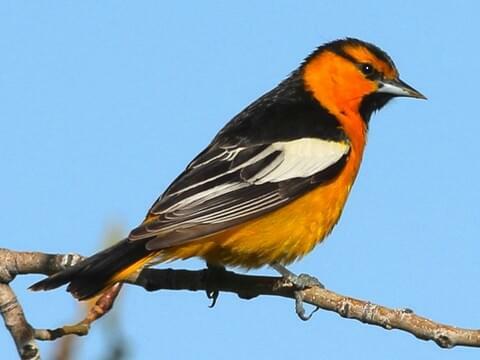 One of the most brilliantly colored songbirds in the Eastern US, the Orioles feathers are flaming orange and black. These birds share the heraldic colors of the coat of arms of 17th-century aristocrat, Lord Baltimore. Widespread east of the Great Plains, Baltimore Orioles are very common in open woods and tree groves with wide separation. This bird variety was formerly considered to belong to the same species as the western Bullock’s Oriole, under the combined name of Northern Oriole. Baltimoreans are working to keep the species alive, though efforts of fighting mother nature have their challenges. Over the years there have been various versions of The Bird. One is pictured below and was called, “the ornithologically correct bird.” I preferred it to the exaggerated angry bird mascot, but they never asked me. It was always with some irony for me to recall that the long-time manager of the team was also in the weaver family. Earl Weaver, the hot-headed, chain-smoking, kick dirt on the umpire he disagreed with, Hall of Fame coach, was another Major League icon. The Florida Winter League was always fun to watch, as the team broke into two: one coached by assistant coach Billy Hunter (Hunter’s Bunters) versus those players coached by Weaver (Weaver’s Beavers). The spirit and camaraderie of those teams in the 1960’s and 1970’s were electric, as the Orioles seemed to be near contention for the playoffs every year. Except for those damn Yankees, we had one of the best teams in the majors and it was fun to listen to the games on the radio and follow Weaver with all of his antics on the field and in the dugout. He made it to Cooperstown following his pitching/homerun philosophy: “pray for Doctor Long-ball; he will cure what ails you.” According to his bio, Weaver is the longest-tenured manager in Oriole franchise history, with 2,541 games of service in parts of 17 seasons (1968–1982, 1985–1986).